Hundreds of parents, students and teachers gathered in the gym of J.N. Burnett Secondary School Wednesday night to express their views on the code of conduct program related to gender identity. Tensions were high in a Richmond high school Wednesday night as the city's school board voted in a code of conduct program related to gender identity. 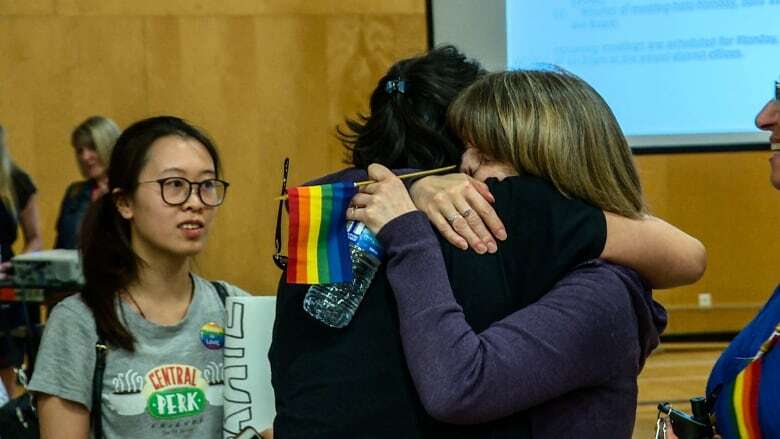 The school board voted 6-1 in favour of adopting the province's Sexual Orientation and Gender Identity toolkit, known as SOGI 123. Hundreds of parents, students and teachers gathered in the gym of J.N. Burnett Secondary School to express their views on the program, which requires schools to update their codes of conduct to prevent bullying and harassment. Opponents of the program call it "indoctrination," and protested outside the school before the meeting started. Dozens of people who spoke out against SOGI walked out after midnight, before the final vote. "Right now we need this, we really need this policy," said Grade 12 student Leichelle Young, who attends Richmond Secondary. "Before, things were getting reported but nothing was changing." School board trustee Eric Yung said he thinks the opposition to the program comes from confusion about the specific details of the program. "There's a misunderstanding about what it entails ... what it doesn't entail, what the content is," he said. "We will have to reach out ... we are a learning organization first and foremost, and we will reach the parents to hopefully bridge that gap." The SOGI program was introduced in B.C. last September, after the provincial human rights code was amended to include gender rights in 2016.